Sprinkle gelatin over 1 cup of cold rum in a large bowl and mix thoroughly. Heat 3 cups of pina colada mix in a saucepan until boiling. Add hot pina colada mix to gelatin and rum mixture. Stir for 5 minutes until gelatin completely dissolves. Spray a 9 x 12-inch pan lightly with nonstick cooking spray. Pour gelatin mixture into pan. Refrigerate for 3 hours. Soften Tootsie Rolls for 5-8 seconds in a microwave (two Midgees at a time.) Roll one into a small circle and roll the other into the shape of a top hat. Press them together and poke a drink stir stick into the bottom. Using your cookie cutters or plastic tubes, cut the snowman circles from the firm, refrigerated gelatin — 12 of each size. Starting with the smallest circles, skewer them onto the drink stir sticks with the hats. Add the next two sizes to each stick. Add eyes, noses and buttons with food coloring markers or tiny decorator candies. 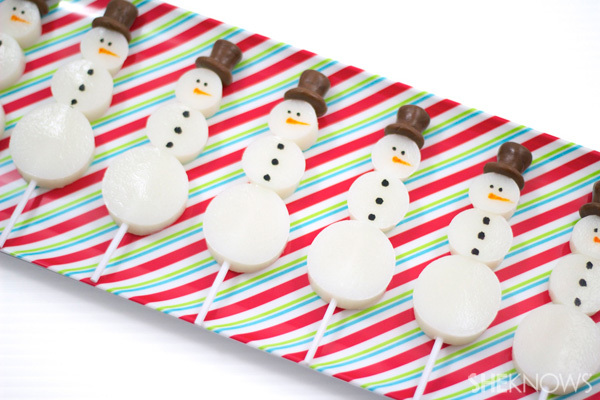 Add your snowmen Jell-O shots to a cute platter and set out at your holiday party.